Western blot analysis of extracts from NIH/3T3, C6 and MCF7 cells using p27 Kip1 (SX53G8.5) Mouse mAb. 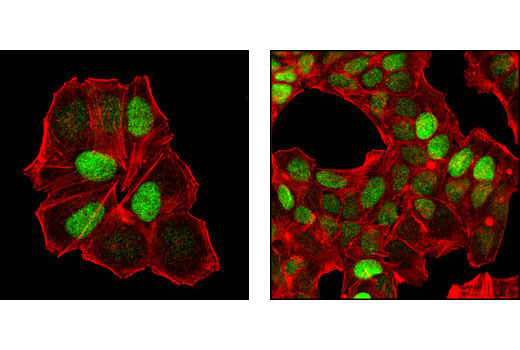 Confocal immunofluorescent analysis of MCF7 cells using p27 Kip1 (SX53G8.5) Mouse mAb (green). Actin filaments have been labeled with DY-554 phalloidin (red). 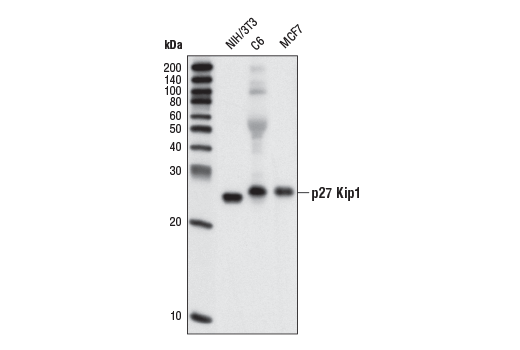 p27 Kip1 (SX53G8.5) Mouse mAb detects endogenous levels of total p27 Kip1 protein.